One of the great advantages of ac over de for electric-power distribution is that it is much easier to step voltage levels up and down with ac than with dc. For long-distance power transmission it is desirable to use as high a voltage and as small a current as possible; this reduces i2R losses in the transmission lines, and smaller wires can be used, saving on material costs. Present-day transmission lines routinely operate at rms voltages of the order of 500 kY. On the other hand, safety considerations and insulation requirements dictate relatively low voltages in generating equipment and in household and industrial power distribution. The standard voltage for household wiring is 120 V in the United States and Canada and 240 V in many other countries. The necessary voltage conversion is accomplished by the use of transformers. Here’s how a transformer works. The ac source causes an alternating current in the primary, which sets up an alternating flux in the core; this induces an emf in each winding, in accordance with Faraday’s law, The induced emf in the secondary gives rise to an alternating current in the secondary, and this delivers energy to the device to which the secondary is connected. All currents and emf’s have the same frequency as the ac source. where VI and V2 are either the amplitudes or the rms values of the voltages. By choosing the appropriate turns ratio N/NI’ we may obtain desired secondary voltage from a given primary voltage. If N2 > NI, as in Fig. 32-16, “_> VI’ and we have a step-up transformer; if N2 <NI, then V2< VI’ and we ha sup-down transformer. At a power generating station, step-up transformers are used; primary is connected to the power source, and the secondary is connected to the on lines, giving the desired high voltage for transmission. Near the co step-down transformers lower the voltage to a value suitable for use in home or transformers. V1I1 = V2I2 (currents . Transformer primary and secondary). This shows that when the secondary circuit is completed through a resistance R, the result is the same as if the source had been connected directly to a resistance equal to R divided by the square of the turns ratio, (NiNi. 10 other words, the transformer “transforms” not only voltages and currents, but resistances as well. More generally, we can regard a transformer as “transforming” the impedance of the network to which the secondary circuit is completed. Equation (32-36) has many practical consequences. The power supplied by a source to a resistor depends the resistances of both the resistor and the source. It can be shown that the power transfer is greatest when the two resistances are equal. The same principle applies in both de and ac circuits. When a high-impedance ac source must be connected to a low-impedance circuit, such as an audio amplifier connected to a loudspeaker, the source impedance can be matched to that of the circuit by use of a transformer with an appropriate turns ratio NiN”. Real transformers always have some energy losses. The winding have some resistance, leading to;2R losses, although superconducting transformers may appear on the horizon in the next few years. There are also energy losses through hysteresis in the core (Section 29-9). Hysteresis losses are minimized by the use of soft iron with a narrow hysteresis loop. Another important mechanism for energy loss in a transformer core involves eddy currents (Section 30-7). 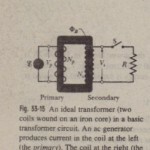 Consider a section AA through an iron transformer core (Fig. 32-17a). Since iron is a conductor, any such section can be pictured as several conducting circuits, one within the other (Fig. 32-17b). The flux through each of these circuits is continually changing, so eddy currents circulate in the entire volume of the core, with lines of flow that form planes perpendicular to the flux. These eddy currents are very undesirable; they waste energy through j2R heating and themselves set up an opposing flux. the characteristic “hum” of an operating transformer. This type of design is used in small transformers for home appliances as well as in the large transformers used at power stations (Fig. 32-18). Thanks to the use of soft iron cores and lamination, transformer inefficiencies are usually well over 90%; in large installations they may reach 99%.